The Michigan Institute for Computational Discovery & Engineering (MICDE) seeks proposals for innovative research projects in computational science that combine elements of mathematics, computer science, and cyberinfrastructure. Of interest is computational science research in any emerging area, including but not limited to (a) applications such as neuroscience, ecology, environmental science, evolutionary biology, human-made complex systems, urban infrastructure and energy; and (b) frameworks for scientific software, and exascale computing. Priority will be given to high-impact projects with potential to attract external funding. MICDE expects to fund 3-4 one-year projects at up to $100,000 each. An informational session will be held on Thursday, Nov. 10, 2016 at 2:00 p.m. in Room D of the Michigan League (911 N. University). 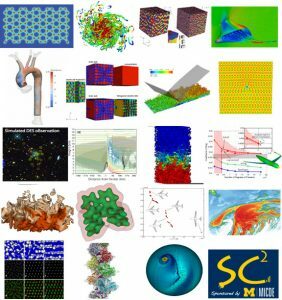 Applications are now being accepted for the Department of Energy/Krell Institute Computational Science Graduate Fellowships. The fellowships include a yearly stipend of $36,000, payment of full tuition and fees during the fellowship period, a $5,000 academic allowance in the first year, up to 4 years of total support, a 12-week practicum at DOE national laboratories or sites, and more. The program is open to U.S. citizens or permanent resident aliens who plan full-time, uninterrupted study toward a Ph.D. applications are encouraged from students in engineering and the physical, computer, mathematical or life sciences. Undergraduate seniors, applicants with no more than bachelor’s degrees who are not currently enrolled in graduate school, and first-year graduate students are eligible to apply. See the program’s web site for more information and for application instructions. Please visit our Current Grant Opportunities page for a listing of open funding submissions from a variety of agencies. You must be logged in with your University of Michigan Kerberos password to view the spreadsheet. The spreadsheet contains grants relevant to advanced computing infrastructure and research from NSF and NIH. Enlighten Your Research Global is a program organized by 13 global National Research and Education Networks (NRENs), with the goal of identifying research programs that could significantly benefit from enhanced global network connectivity. The group aims to foster international collaborations to accelerate the research and discovery process. To promote the benefits of international-scale networking to researchers, EYR Global is challenging researchers to stretch the boundaries of their science and collaborate with other countries to perform experiments enabled by the NREN’s world-class network infrastructure. The EYR-Global program awards select projects with expert engineering support, consultation, and collaboration to guide and enhance researchers’ workflows. The selected proposals will receive networking resources that they need for their project for one year. The EYR partner NRENs, along with any affiliate partners, will provide and develop high-quality network services for all higher education and research institutions in their respective countries. The required network connection will be delivered to the NREN termination point at the institution (if present). The institution is responsible for extending the connection within the institution and for the required infrastructure. The initial application deadline is May 29. Visit the EYR Global website for more information and submission details. The U-M Office of Research is taking requests for proposals for collaborative research in applications of nanotechnology and data science as part of the University’s ongoing partnership with Shanghai Jiao Tong University. Details on the Call for Proposals, application form and additional information are available on the U-M Office of Research website. Proposals are due by April 20, 2015, 5:00pm EST and must clearly demonstrate a synergistic collaborative program of UM and SJTU investigators. Applications are now being accepted for Michigan Institute for Computational Discovery and Engineering (MICDE) Fellowships for the 2015-2016 academic year. Applicants should be graduate students enrolled in either the CDE certificate program, or the Ph.D. program in Scientific Computing. Students not yet enrolled in one of those programs but planning on doing so may simultaneously submit program and fellowship applications. Fellows will receive a $4,000 research fund that can be used to attend a conference, to buy a computer, or for any other advisor-approved activity that enhances the Fellow’s graduate experience. We also ask that Fellows present a poster at the MICDE Symposium in Fall 2015. Interested students should download and complete the application form, have it signed by their advisor, and submit it with a one-page resume to MICDE-apps@umich.edu. The due date for applications is March 27, 2015.